A meat thermometer (every kitchen should have one) is the best way to know what is going on inside your meat. They are also known as Instant-Read Pocket Thermometers and can be purchased in grocery stores, kitchen stores, and online for under $10.00. Think about it, you probably paid more for meat for two than you would for a thermometer, so why take a chance of over or under cooking the meat? 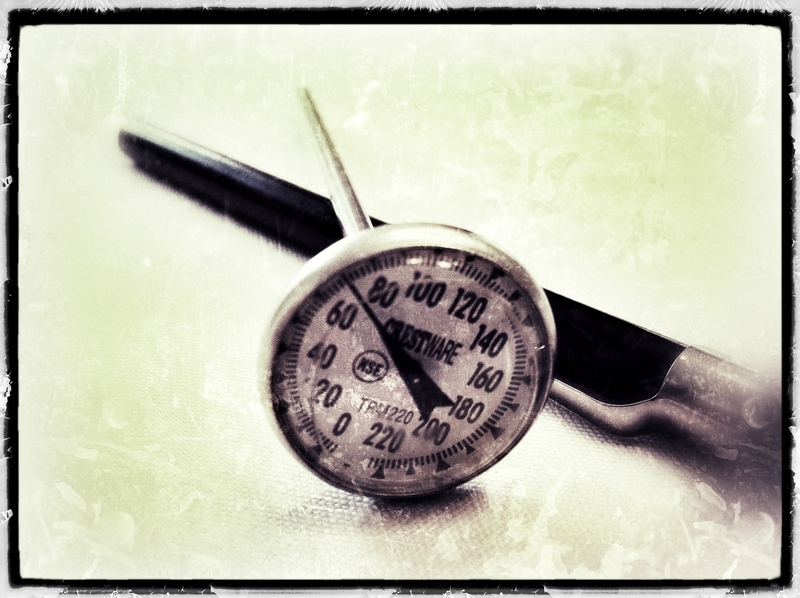 So how do you use a meat thermometer? 2. Check the internal temperature of the food near the end of the cooking process. 3. Place the thermometer in the thickest part of the meat or in the center of the food to get a true reading. Do not touch the bone with the stem of the thermometer, this will give a false reading. 4. Leave the thermometer in the food for 15 seconds to get an accurate reading. 5. Check the temperature of large cuts of meat in two or more locations to be sure. 6. Wash and sanitize the thermometer each time you check the temperature of the food. 7. Refer to the temperature guidelines below for desired results. 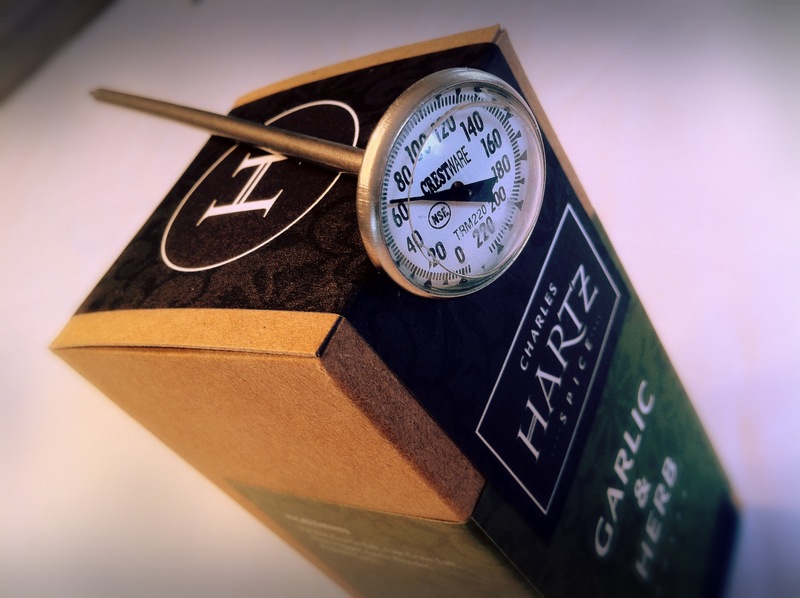 When using a food thermometer you will need to be sure it is calibrated. Calibrating is an easy process done either by using ice water or boiling water. Calibrate your thermometer every time you use it and whenever it is bumped or dropped. If you do you will know it is telling you the correct temperature. 1. Fill a cup with ice cubes. 2. Fill the cup with water. 3. Put the stem of the thermometer 2 inches in the ice water and wait 30 seconds. 4. The thermometer should read 32 degrees F.
5. If it reads 32 degrees F then you are good to go. If not see the Adjusting Diagram. 2. Put the stem of the thermometer 2 inches in the boiling water and wait 30 seconds. 3. The thermometer should read 212 degrees F.
5. If it reads 212 degrees F then you are good to go. If not see the Adjusting Diagram. 1. 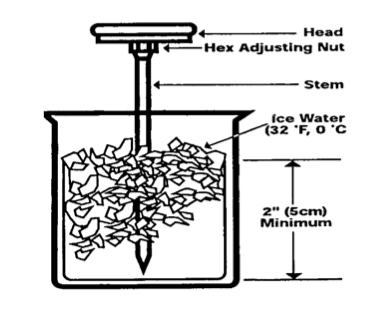 While holding the head, use pliers or a wrench and turn the nut on the back of the thermometer until the needle reads 32 degrees F for the ice water or 212 degrees for the boiling water. 2. Test the thermometer in the ice water or boiling water to see if it needs more adjusting once more. This simple, inexpensive tool can help make a dining experience memorable. Below is an Internal Temperature Guide for meats to be removed from the heat (cooking source) and allowed to rest. The meat should “rest” for about five minutes for smaller cuts (Steaks, Chicken Breast, Chicken Legs, Fish, Hamburgers) and up to 45 minutes for larger cuts (Whole Chicken, Prime Rib, Whole Turkey). During the resting process the meat will continue to cook and the temperature will rise but this resting process will also allow the meat to relax. 1. In a 2 quart pot add the first 2 Tbsp. olive oil and the 1/2 yellow onion and sauté on low until the onions have soften and become translucent. 2. Add the black beans with juice and Garlic & Herb spice. Simmer for about 30 minutes stirring often. 3. Add the refried black beans and heat through. 4. Place the beans into a bowl. 1. Dice the turkey into 2 inch cubes. 2. 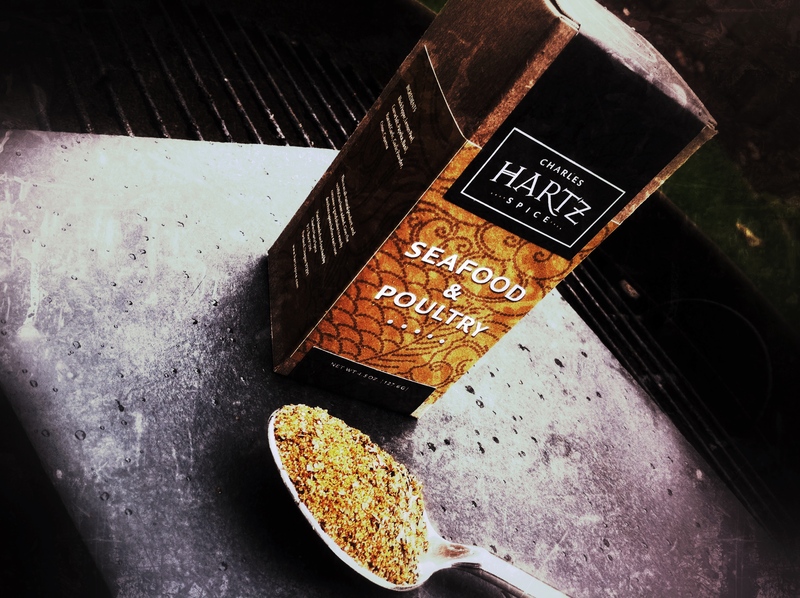 Sprinkle with the Black Bayou Spice blend. 3. In a 4 quart pot add the second 2 Tbsp. olive oil and the yellow onion and garlic and sauté on low until the onions and garlic have soften and become translucent. 4. Add the turkey and sear all sides. 5. Add the diced tomatoes and bring to a boil then reduce to a simmer. 6. Cover and continue to cook for about 45 minutes or until the turkey can be shredded easily. Stir often so it does not burn. 7. When the turkey falls apart easily remove it from the pot onto a sheet pan. 8. Using two forks shred the turkey. 9. Place the turkey into a bowl. 1. Spoon some black beans onto the tostada shell. 2. Add some shredded turkey. 3. Add the crumbled Queso Fresco cheese. 5. Sprinkle with some of the cilantro. 6. Squeeze a lime wedge over the top. * You can prepare the beans and turkey meat at the same time. * Add more Black Bayou Blend to the turkey to make it spicier and you can also add it to the black beans. * Diced avocados if you like. 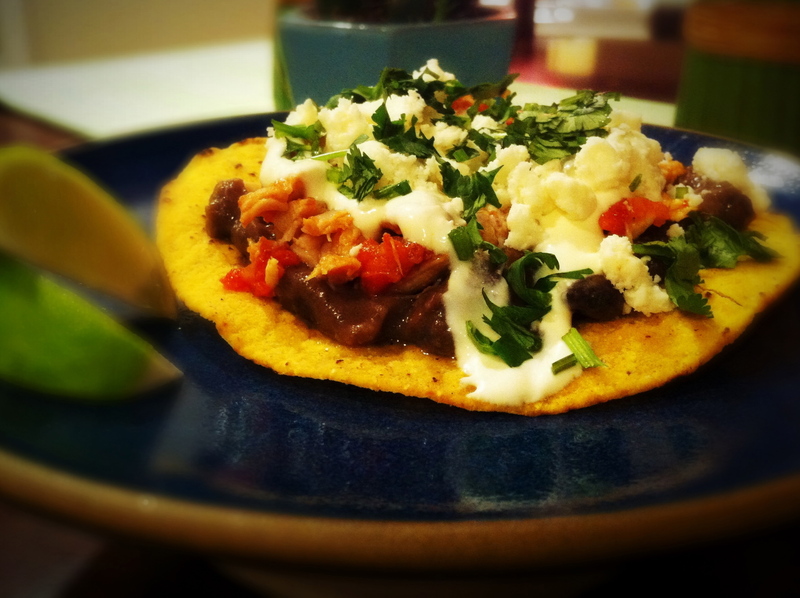 * The Tostada Shells, Queso Fresco, and Crema can be found in most grocery stores.